Thanks to everyone who gave opinions on my "Defense of echo base" dio - I took the points on board and managed to build my own probe droid! It's not perfect, but I probably spent more time on it than the rest of the model! 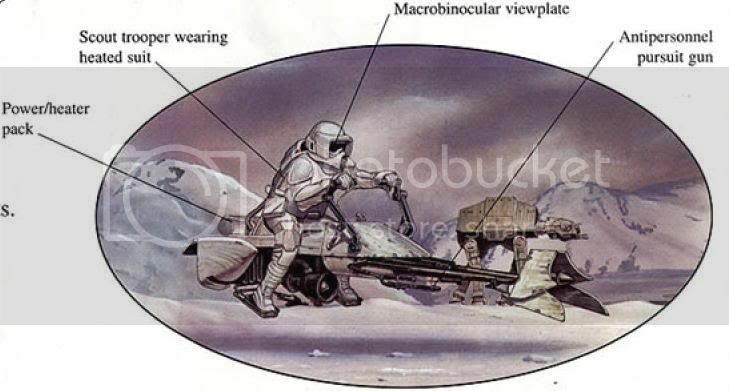 Anyway, I present a dio of an Imperial search party 'mopping up' after the battle of hoth. Couple of points to note - Yep I know its the speeder from the TLC hoth base set, I've modified it a bit, but I'll get around to trying to build my own soon. Second point - yep, the pilot's guns aren't 'proper' star wars guns, but they are the best pistols I had for the job. Once again, a very nice MOC!! *snowtrooper* "They can't hide those burgers from us, look there's a trail of ketchup!" I like the probe droid. See, when you go to the trouble of pulling out the sarcasm, inevitably someone goes and does some research and finds out that your carefully-crafted sarcasm is misplaced. Scout troopers were also deployed on the planet Teardrop during a massacre of civilians conducted by the ISB, and by the 501st Legion on Shelkonwa during a search for Leia Organa. Later in the War, scout troopers participated in the Battle of Hoth and were sent to search for Luke Skywalker on Myrkr by Grand Admiral Thrawn. It was still a good line, though. On subject, I really like the dio. The droid is too squat, but you knew that. You can make more of these anytime, and I'll like them. Keep up the good stuff. As for the moc, very nice. The cave is very nice looking, and the probe droid is really cool. Awesome MOC dude. Nuff said . Another great work! Like the idea of a bood trail. Absolutely brilliant whats next? yeti assault? The probe droid looks great. Good work! The three-dimensional "baseplate" you created here is amazing! You have proven to have a good hand for sloping techniques! It looks very natural. The scenery on it is perfect. Well done!